Arahama was annihilated by the tsunami. There was nothing in its wake. Zero. The 3,000 and several hundred residents were all scattered – there were approximately 180 farming families, but we lost our houses and all our equipment. 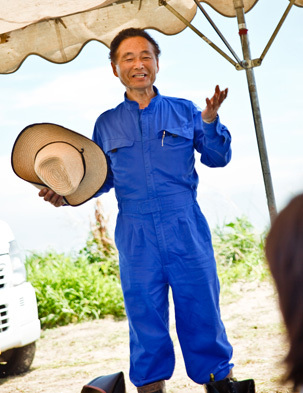 The farming business in Arahama was managed by a juridical agricultural union by the name of Arahama Nosan (Arahama Farming Produce荒浜農産) but its president and directors fell victim to the disaster and lost their lives so the farmers were at a loss and could not do anything. I have my own juridical agricultural union in Misatocho, located in the inner region of the affected area, with 50 hectares of farmland, and a part of that was in Arahama. It was only a small percentage of my land, so I thought about giving it up. But I could not abandon the people I have worked with for years. I felt I needed to contribute in some way to assist them. But with no idea on how the recovery efforts would be executed, I could not make any plans or negotiate. What was once rice paddies had become a pile of rubble and the farmers had all but lost hope and any will to go on. Just then, we received a proposal from the spinning industry and other related businesses if we would be interested in growing cotton, which is resistant to salt contamination. I had no idea what cotton is like as a crop, but I felt I had nothing to lose so I decided to participate. When I called on other people to join me, most of them were living in the evacuation centers and said, “There is nothing else we can grow, so why not?” so we decided to work together. If we just stayed in the evacuation centers and did nothing, both our bodies and souls would deteriorate… we all wanted to do something; anything – so we came together. 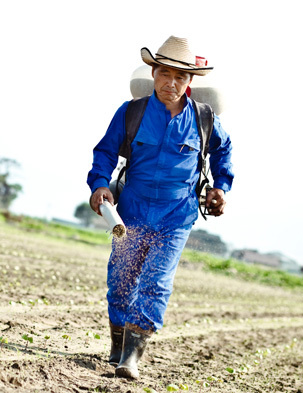 Our cooperative began with five farmers and we are now ten. One of us just happened to still have a house and work space as well as farming machines nearby, so we decided to use his place. Thanks to his joining us, we were able to secure space to work. Without it, we would have had to commute over one hour each way with equipment from Misatocho, so that may have discouraged us. Once we began, we received so much support that it gradually became enjoyable. 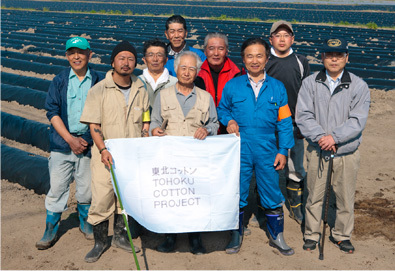 This became a huge project with supporters visiting us from all over Japan many times, so there was no way we could fail in growing cotton. For us, the sense of gratitude and appreciation for all the support we receive is truly important, too. The results were that we were only able to harvest about two cardboard boxes full at the end of the first year. But if we let that discourage us from continuing, the project would never grow. That is how we feel, so we want to increase our fields and plan to expand the cotton farms to 10 times what we did last year. To realize that, we need to lease more farmland, and we are making various preparations to this end. We are asking farmland owners to choose between consignment farming or exchange cultivation. Some people have never left the evacuation centers or temporary housing since the disaster struck, so it is a laborious effort to explain everything we did this year and the project itself from scratch, but if the land is not converted into farmland again, it just turns it into waste land. If we can lease the land, we will look after it and if they participate through this project, we hope they can have a tangible sense that we are taking positive steps towards recovery and have emotional closure and a sense of direction to move forward. If we take a candid look at what we can achieve, 1 to 2 hectares may be all we can manage. But that would not enable this project to fulfill its potential. To make Arahama a large production center, we are committed to dig our heels in now. And when we are able to produce ample cotton, we believe we can expand into rice, wheat, and soy beans as well as other crops again. We are a cooperative now, but perhaps it will be easier for other farmers to participate if we incorporate and become eligible to receive support from the central government or to take out loans, and are able to expand into other crops. If that is our goal, then we probably do not need to use the word “cotton” in our name. I hope that our group can spearhead the re-farming of Arahama so that its recovery can be accelerated.